Lahir 2010 Tri-State: Save Punjab. Save Ourselves. In the 1920’s and 1930’s, America witnessed a cultural movement in the heart of New York City. The Harlem Renaissance brought a fresh wave of music, theatre, poetry, art and intellectual thought to the fore. This movement gave birth to the likes of Langston Hughes, Zora Neale Hurston, Countee Cullen, Duke Ellington and many others who are now respected as pioneers of their genre. The Harlem Renaissance brought more than just a new style of entertainment…it put the black experience on the map – and uplifted a race that was in transition with its place in America. On November 20 – in a stone’s throw away from Harlem – musicians, poets, and artists will gather to put the Sikh experience on the map. After a successful event in the Tri-State area last year focusing on remembrance and inspiration from the events of 1984, the Lahir team has assembled once again for “Save Punjab. Save Ourselves.” This year’s focus is on issues affecting rural Punjab – such as farmer suicide, female infanticide, drug abuse, disease, and poverty. 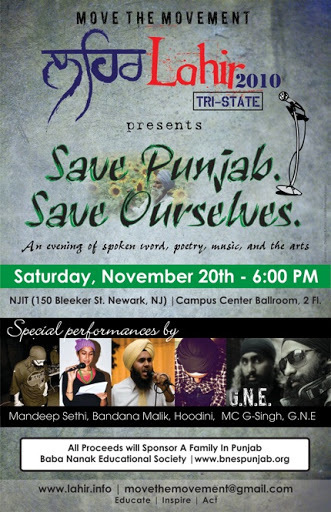 I’m particularly impressed with the connection that organizers and performers have with issues affecting Punjab, many of whom were born here in the US, but as dozens of news reports filtered in over the past year speaking to the dire social, economic, and environmental situation in rural Punjab, it is evident that Sikh youth across North America will not remain silent. The bond Sikh youth feel with the land of our ancestors and history runs deep. Still the home of nearly 20 million Sikhs, any issue affecting our brothers and sisters in Punjab, affects Sikhs all over the world. Some may ask, what does an evening of music and poetry bring to the cause? Does it really create change? I know for myself music and poetry have made me aware and feel issues that I never would have connected to any other way. K’Naan’s music has exposed me to life in Mogadishu amidst the Somali Civil war, Suheir Hammad’s poetry gives me a glimpse of life growing up in a family of Palestinian refugees. These are experiences you will not learn from news bytes on CNN. They shape my thinking, and my thinking (hopefully) leads to action. Some questioned the impact of the Harlem Renaissance, while others felt it laid the framework for the Civil Rights movement. Will the Lahir movement and similar initiatives lead us toward bigger things to move the Panth forward? Only time will tell. But I know how I felt after an evening of listening to my brothers and sisters bring their talents to the mic – all while united in a cause…it feels like anything is possible. Lahir: Move the Movment – Save Punjab. Save Ourselves.